When Lloyd was visiting this campus during the “Celebration of the Liberal Arts” weekend in fall 2002, I had the pleasure of engaging in a dialogue with him about classes during his time at Allegheny and how technology has made the entire classroom experience virtually experiential. 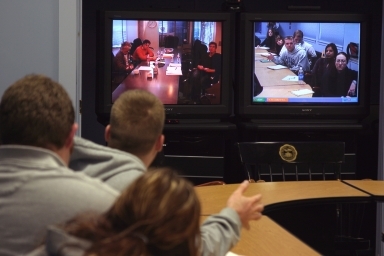 The conversation led to a discussion about the videoconferencing seminar room at Allegheny, and all of a sudden the two of us were shaking hands over the exciting prospect of co-teaching a class on Television Studies, even though we’d be thousands of miles apart. In fall 2004, this dream came true. An upper-class seminar of thirteen Allegheny students gathered in the videoconference room, to join Lloyd and Hollywood professionals each week to learn about the different factors that inform the political and practical aspects of the television business. Academic course material and lectures supplement- ed these experiential learning sessions, and the magic of this collaboration was that it connected so strongly the learning we do in the classroom with its practical applications in the working world. Again and again, the students heard talent agency representatives, filmmakers, script-writers, producers, and network executives stress the importance of critical thinking, reading, and writing – the three core components that we emphasize as part of our liberal arts curriculum. It was also heartening for students (and for this instructor) to hear industry people emphasize that you don’t need a specialized degree at the undergraduate level in order to succeed in the “real” world. Too often, I think, students undervalue a liberal arts education because they fear they will not receive the training that will get them into lucrative corporate positions. What my students took away from these mediated conversations was how fortunate they are to be receiving an interdisciplinary education that makes them better-rounded and more interesting candidates in the job market than their university counterparts. Lloyd has found a new way of staying connected to learning and to his alma mater – this time as an educator. This class thanks him for being a committed educator and mentor, and at Allegheny we look forward to many more classroom experiences with him in the upcoming years. This article was featured in the Spring 2005 issue of Allegheny Magazine.